When you think of choosing a chandelier for the dining room, it's more than just picking a fixture that you've seen in a magazine or someone's home. Chandeliers are like the jewelry we choose for a certain outfit. Chandeliers define your home's style and the informality or formality of a room. Chandeliers add sparkle, glamour and finish off a room with a flick of a switch (make sure to install a dimmer!). Before you start hunting for the perfect chandelier, you need to get your facts straight! 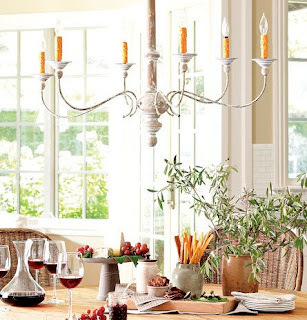 First, measure the length and width of the dining room to determine the correct size or diameter of the chandelier. For instance, if your room is 18 feet by 12 feet, the chandelier should be approximately 30 inches in diameter. But, and there is always a 'but' - if the room has an extra high ceiling, then take that into consideration as well as the size of the table beneath it. The larger volume of space may call for a somewhat larger fixture. In any case, walking the floor of the lighting store to find the right chandelier is not a walk in the park. Do not plan on finding a chandelier at first sight. I like to take a 'once around' of the store layout to get a feel for what the store has to offer. Then I spend more time and thought till I can hone in on a few that fit my client's unique style. While you gaze at the almost endless choices, you will find yourself pinpointing styles that work for you and those that are a definite no-no. Do you want glass shades, crystals, a gilded or wrought iron look. Will the chandelier require frequent cleaning? If there are silk shades can they be interchanged with different colors for the seasons? Most of all, what look are you going for - romantic, urban-contemporary, rustic, elegant or glitzy? What Color Is Your Chandelier? Last but not least - make sure you have a photo of your dining room table and chairs to refer to while shopping. If nothing suits you, do not feel hopeless! The right chandelier is out there and the hunt makes the catch all the more worthwhile. Oh and by the way, when you've found the perfect fixture, make sure it is installed between 30 and 36 inches from the dining table top. Check back soon for the third in this series on Dining Rooms! Mary Alice Smith of M. A. Smith, Ltd. - an interior designer serving New Jersey, including Ocean and Monmouth County, the Jersey Shore and metropolitan New York areas. Wow, what a neat idea! Imagine never having to tell your kids, class, or employees to "not mark up the walls!!" Or better yet, think about all the trees you could save by using Wink to post erasable notes instead of using Post-its on the walls. 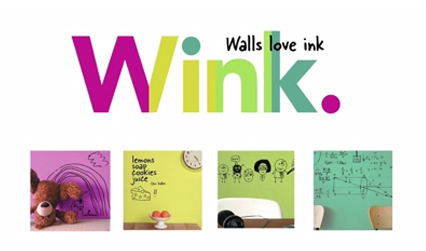 According to 'Wink' this product is "The clear, dry erase coating that lets you turn any paintable surface into a write-and-erase canvas. So let the true color of your wall show through, without the limits of a whiteboard." Can't wait to use this on my next family oriented design project! Part V - Of The "Five Most Common Decorating Problems that People Have in Decorating their Homes"
Wherever you go - Facebook, Twitter, Linkedin, parties, meetings, family dinners, everyone is talking about their goals and changes they want in their home. We all may be different, but then we all have so much in common. One of those items we have in common is that we all have distinct ways we process change. Change is a funny thing. It can be good or bad. It means different things to different people. Some people thrive on change. Others sense change as scary or intimidating - so much so that it stops them in their path of doing something new. All of my successful decorating clients want change. Some need encouragement to go forward. Others need a second opinion in their decisions. But most of all, they realize that doing nothing means things stay the same. The living room will look the same, the kitchen will stay cramped and dated, etc. The biggest problem in decorating to me is the decision to make a commitment to schedule a date when the home makeover will begin. You can talk about it, spend hours on Pinterest, read every decorating magazine on the newsstand. But, nothing will happen till you pull out your calendar, call your contractor, call your interior designer, or visit the kitchen showroom. Lesson #5: Change is good!